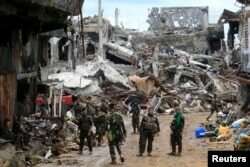 FILE - A woman stands at her ruined house, after residents were allowed to return to their homes for the first time since the battle between government troops and Islamic State militants began on May 2017, at the Islamic city of Marawi, Philippines, April 19, 2018. The Philippine president's offer of work and possible amnesty to holdouts from a violent Muslim rebel group that battled troops last year may bring momentary calm to an embattled southern island, experts say. President Rodrigo Duterte visited that city, Marawi, on May 11 with pledges to provide shelter and “livelihood assistance” to 27 surrendered holdouts of the Maute Group, the presidential website says. Duterte’s move will help deter new violence in Marawi in the short term, analysts say, if he proves sincere. That calm would help the city rebuild, allowing more of its 200,000-plus inhabitants to return after fleeing the war. It might raise hopes among other rebel groups on Mindanao, the historically violent island where Marawi is located, for better interaction with the government, they say. FILE - Government soldiers stand in front of damaged houses and buildings in Marawi city, Philippines, Oct. 25, 2017. FILE - President Rodrigo Duterte speaks during the 121st anniversary celebration of the Philippine Army in Taguig city, east of Manila, Philippines, March 20, 2018. 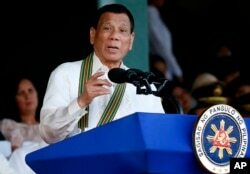 Duterte’s offers this month came just ahead of the Muslim holy month of Ramadan, casting it as a “diplomatic gesture,” said Rhona Canoy, president of an international school in the nearby city Cagayan de Oro and part of a family active in local politics. People from the city feel “a lot of resentment” because of the extent of war damage, she added. For Maute Group members who surrendered, Duterte indicated last week he would offer “idle land” in their home province to grow rubber trees and produce palm oil, the head of state’s website says. Duterte said on his visit he would look into the possibility of amnesty for Maute rebels with old arrest warrants but willing to surrender. They “should be willing to talk peace” and avoid Islamic State or any alliance with the country’s armed communist rebels, he said. 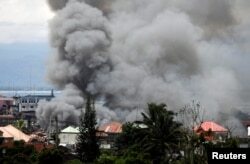 FILE - Smoke rises in the residential neighborhood of Marawi City as fighting rages between government soldiers and the Maute militant group, in southern Philippines, May 27, 2017. It’s unclear whether Duterte will keep his pledges to Marawi, Atienza said. Rebel groups in Mindanao have shown a pattern of retrenching under new names or different locations after fights with troops or police. Muslims have lived in the 21 million-population island’s west and outlying islands for some 500 years, chafing at times against the country’s Christian majority over resources. Muslim Mindanao’s 20 rebel groups may want solutions other than amnesty and a livelihood, analysts caution. One group, the Moro Islamic Liberation Front, wants Congress to pass a stalled law that would give them greater autonomy following a 2014 peace deal, for example. “I think the military knows that the ISIS flags have been flying in those villages for some time now. And I think the ideology is very difficult to root out,” said Eduardo Araral, associate professor at the National University of Singapore’s public policy school.